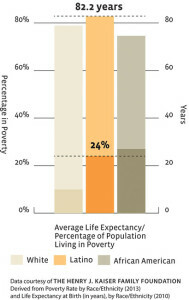 Despite nearly a quarter of U.S. Latinos living in poverty, the group as a whole has a higher average life expectancies than white Americans, who have a much lower poverty rate. This article from Yes magazine has some theories as to why. It’s about Latino traditions of food, community and family bonds. Author Claudia Kolker took a closer look at such cultural practices for her 2011 book, The Immigrant Advantage. Her book examines why immigrants are often healthier than native-born Americans—a question that continues to be explored. Some credit this perplexing phenomenon to the idea that immigrants must be healthy to migrate. Kolker’s research shows its connection to customs like Danza Azteca: close community bonds, traditional foods, and la cuarentena, a Latin American tradition in which a new mother rests for the first 40 days after giving birth, not lifting a finger except to breastfeed and bond with her child. Kolker also has a hunch that a lack of smoking is a factor, and other researchers agree. But here’s another paradox. 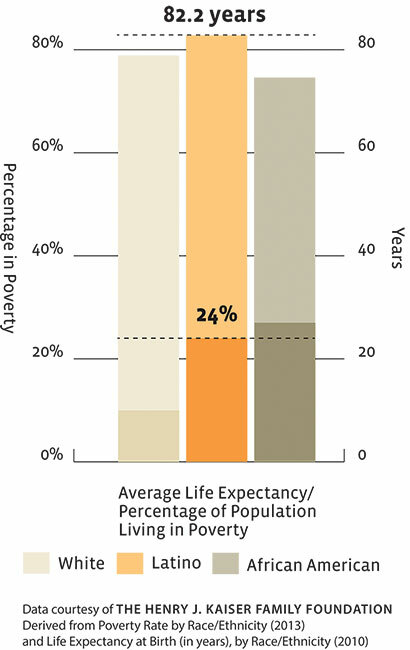 The healthier living advantage is primarily for recent immigrants. U.S.-born Hispanics face higher prevalence rates for unhealthy behaviors than foreign-born Hispanics: a 72 percent higher smoking rate and a 30 percent higher obesity rate. They also have a 93 percent higher cancer rate, according to the Centers for Disease Control and Prevention. Read more about the paradox here.